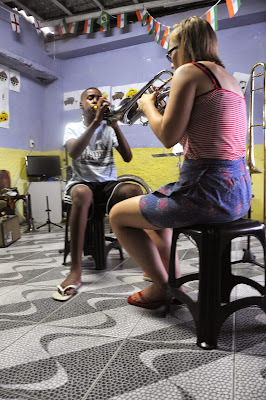 The Favela Brass Project: Thank you Sigrún! For the past three months we've had the immense good fortune to have had Icelandic trombonist Sigrún Jónsdóttir living at the project and giving brass lessons to the children three times a week. 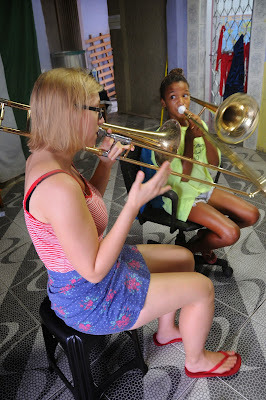 As well as being a top-flight professional trombonist (she's already done a world tour with Björk and leaves us to do a tour of Germany as a solo artist and then another world tour with Icelandic indie folk pop band Of Monsters and Men) Sigrún is also a great teacher and made a huge impression on the children. Sigrún has been to Brazil once before and was already popular with many of the musicians here. With her excellent knowledge of Brazilian music from choro to samba to forro she slotted right in and was in constant demand for shows. 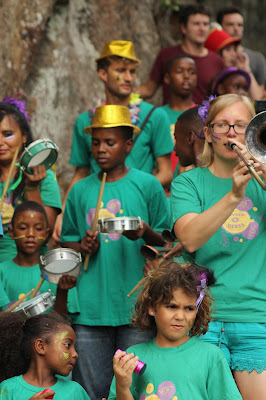 Although her main instruments are trombone and violin, Sigrún also taught trumpet, cornet, tenor horn and tuba at the project. Sigrún says that she says that plans to come back to Brazil after the world tour. Of course we can't take that as a certainly - 18 months is a long time, plans sometimes change, opportunities arise and we understand that. However one thing is for certain: if she does come back, that will make some young Brazilian musicians very happy indeed. I'm very happy that I found your blog.